I love a secret supper club and have been frequenting them for a while now. In fact, supper clubs, pop-up restaurants, underground dining or whatever you want to call them, were part of the inspiration for this here blog you are now feasting your eyes upon. Along with various other great secret London stuff I hasten to add. My first real taste of a supper club was at a paladar in Havana a couple of years ago. Widespread in Cuba, Paladares are small, family-run restaurants where locals open their homes to the public. Friends, neighbours and tourists alike pay a few pesos in exchange for a home-cooked meal in the comfort of their host's home. Now a similar trend has taken off here and it really is a fun, sociable and completely different alternative to going to a restaurant. And as you have to take your own booze, it works out much cheaper too! Upcoming posts will include details about a few excellent supper clubs I've been to over the past year (F&L Saltoun, Pale Blue Door, Food Rambler & Savoy Truffle Club), as well as blogging about any upcoming ones I'm going to attend. 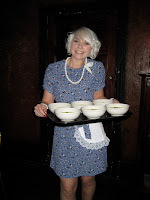 In fact, there are several on the near horizon (including White Room, Nomad Chef, Friday Food Club & Good Stock), so whilst I eat, drink, blog and be merry, please keep your eyes on 'Miss Immy's London' for the latest on which supper clubs should be on your hit list. What could be a better antidote to the cold, dark winter months ahead, than dining somewhere new with friends, enjoying good food, wine and banter. Or even go alone - hey, they'll all become your friends before the evening is over. Hello Winter, I think we're going to get along very well! Click on the Supper Club tab for more news. You know that Pea Soup Recipe, well I may well put it in the Movember cookbook if they deem it to be healthy enough! Does have a fair chog of cream in it!!! A quick note: Fernandez & Leluu now work independently!